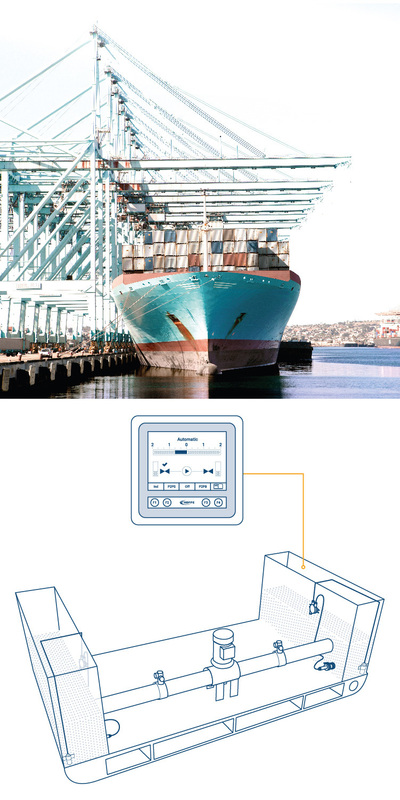 Hoppe is one of the leading suppliers of Heel Control systems in the maritime industry. The portfolio ranges from costeffective standard solutions to tailored and highly sophisticated systems for complex and specialized applications. Heel Control systems are designed to keep any kind of vessel or offshore structure upright with respect to the permissible heel angle limit. The righting moment arising, causing the heel angle, is compensated by shifting ballast water between a set of heeling tank pairs located vis-a-vis on starboard and portside within the ship. The water transfer is achieved by utilizing centrifugal, reversible propeller, or screw-pumps and even air-blower units. 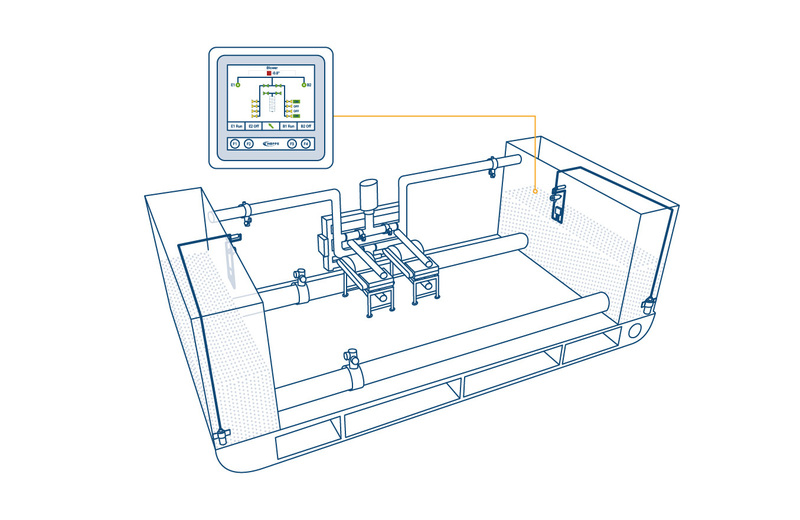 The standard control system offers MANUAL, AUTOMATIC or BALLAST mode operation via HMI – touch screen of PLC unit HOMIP or central PC-Station as well as connections to the alarm and monitoring system (IAS/AMS). In AUTOMATIC mode the system starts to compensate the heel angle when the threshold value exceeds ±0.5 degrees heel. Sophisticated systems, required for loading operations at sea or offshore lifts, are controlled by measuring the actual heel moment generated and adjusting the individual flow rates. Then the control software offers additional operational modes such as ZERO FLOW, FLOW CONTROL and LOAD MOMENT CONTROL. Unique in the market is Hoppe’s ability to combine heel compensation with roll damping functionalities in the same ballast water tank. Valve group for air flow control between 12” to 23”. The heel compensation moment is achieved by transferring ballast water or other fluids between the heeling tank pairs using reversible propeller, centrifugal or screw pumps. Hoppe’s reversible axial propeller pumps are an in-house design especially suitable for bidirectional water shift as required for Heel Control systems. Three different pump sizes are available for vertical and horizontal installation as well as exproof solution. The pump performance is selected for each individual application by varying the gear set and motor type. 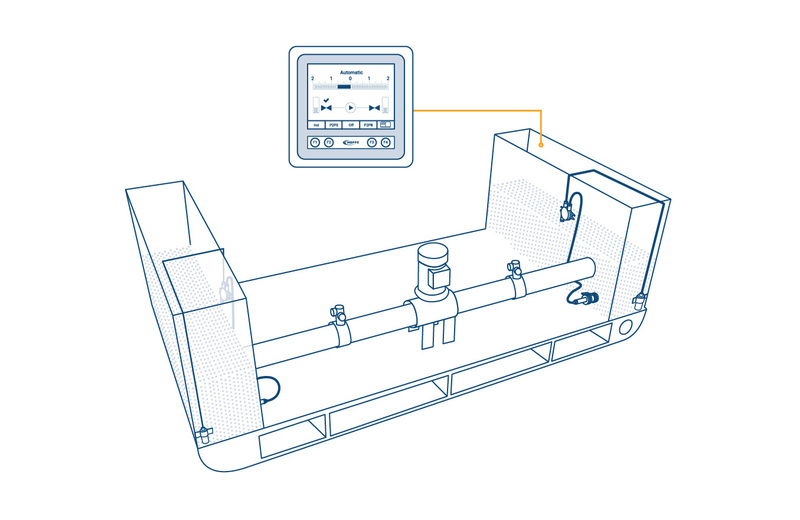 Flow rates of up to 2,500 m³/h per unit can be provided.